This city electrocutes me. When I arrived, I felt like I’d been shaken awake by a storm. 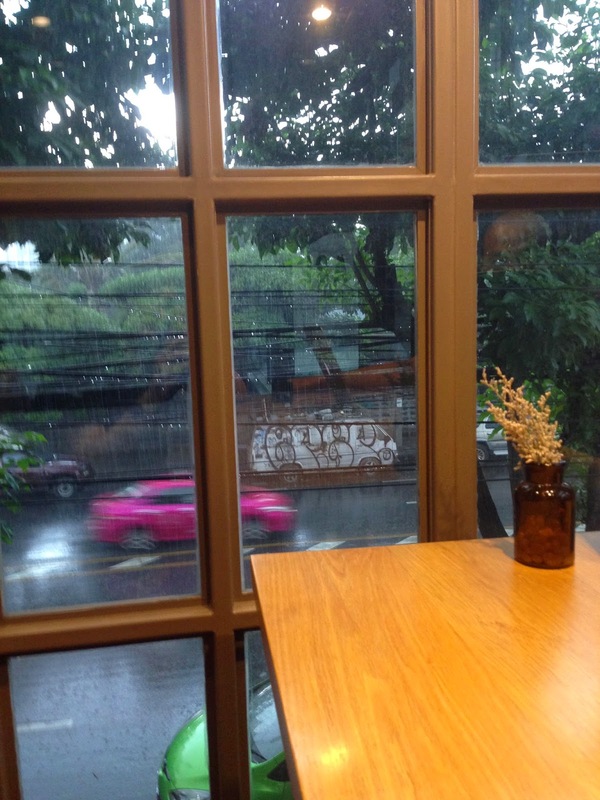 Again I am marooned in a café while the monsoon rains occupied the afternoon hours. This time I'm watching the rain from a second story glass window overlooking Thong Lor street. Bangkok is a city in layers. Above the electric pink taxis and graffiti-covered walls is a canopy of green-leafed trees. From only one floor above the ground, the whole word looks different. The layers above carry a grey sky punctuated by the rigid peaks of buildings. I feel incredibly lucky to be here. We’ve been in Asia for one month now. We arrived in Bali on September 26th and at the time of writing this it is October 26th. It is finally starting to feel like I'm getting the hang of this new temporary life I have created for myself. I have memorized everything in my backpack. I can pack in under a half hour. In one month I have dyed my hair, painted my nails, bought medicine, gotten mildly sick, changed clothes in a shaky train bathroom, and brushed my teeth with the tap water. I am living my life. I miss Portland and my life there, but that feeling is not tugging on my sleeves as much anymore. I have accepted being here. I'm no longer troubled by not-knowing. I am excited by it. Rain just broke out from above. It sounded like a burst of applause from an eager audience. The monsoon rains seem to trail us. I don't mind them at all. Everything in this city moves. TV screens on the trains keep the eyes transfixed on commercials. The rain flows between building and cars. Umbrellas collide on the crowded streets. When the asphalt is wet, I can see the reflections of moped drivers in the dark, slick road. Their reflections move alongside them. More images to absorb. I am so glad I survived Malaysia, if only to make it to Bangkok and experience some real awesomeness. This is a proper city. An international city. The street food is tempting. The sidewalks are wide and the roads are paved. I have a renewed energy in me and I want to use it to do all things creative.